A few months ago, God brought this verse to my attention and set it in my heart as my greatest desire for our family this year. I can’t think of anything that would make my heart happier than knowing my daughter Avery has deep roots. It’s possible that this verse caught my attention because there has been such a deepening of my own roots over the last couple of years. God wants to settle us deep down into him, because the spiritual depth of a mother deeply affects the spiritual depth of her children. Receiving truth from God transforms us, heals us, and sinks our roots into the security and stability of Christ. God has been setting me free from a performance-based identity and fear of failure. He is healing me from the wounds of my past and teaching me who I am in Christ. Allowing your roots to go deeper can be hard work—rocks have to be moved and hard soil may have to be loosened. This is often accomplished through painful seasons of storms and external stressors that challenge our root system. But if we choose to embrace those stressors and work through the places where we are shaken, we will find our roots growing deeper. God has taken some very shallow roots called “my love for Christ” and is deepening them into the rock solid foundation of “Christ’s love for me”. Through God’s redeeming work in us as mothers, our children are blessed. We cannot pass on what we don’t have, so soak up the nourishment that God has for you today through His Presence, His Word, His People. 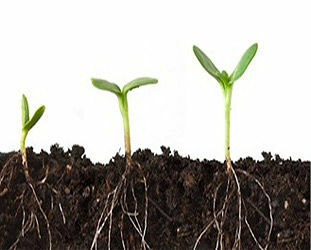 Roots will grow deeper, and our children will grow in wisdom and stature and in favor with God and man. Most roots are not visible. Am I able to see the things below the surface, the deeper issues of the heart? Or am I only focused on outward behaviors? Behaviors give us insight into what’s going on beneath the surface, but if we never get beyond behavior modification, we will raise kids with very shallow roots, and they will most likely struggle with insecurity, lack of confidence, rebellion and shame. As moms, we need wisdom from God to discern what is really going on inside our kids. For me, it takes slowing down my gut-reaction to correct and even punish behaviors that, in reality, may be an indication that my daughter is believing a lie, or needs to know God’s truth about that situation, so that her roots can sink a little deeper. We can join what God is doing in our kids by continually planting seeds of truth and helping to uproot the lies of the enemy when they come up as weeds. This takes lots of time, hard work and diligence, but do not give up! Remember, the Word says that “one plants, another waters, but GOD is the one who makes things grow.” Growth is the part we leave in His hands, and we trust him to deepen and lengthen those roots at the rate He chooses. Through the process, we will see our kids growing full of life and love, as their identity in Christ becomes secure. As a mother, I’m so grateful for a God who invites us to let our roots grow down into Him. Then your faith will grow strong in the truth you were taught and you will overflow with thankfulness. – Colossians 2:7. For more tools on how to raise godly children and teenagers, check out our Kingdom Families conferences with Miles Sweeney (click here). It will change the way that you do life as a family–for the better!